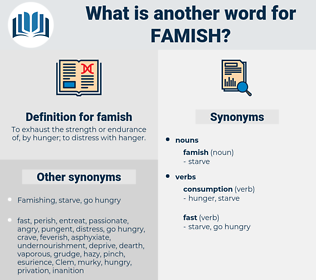 What is another word for famish? 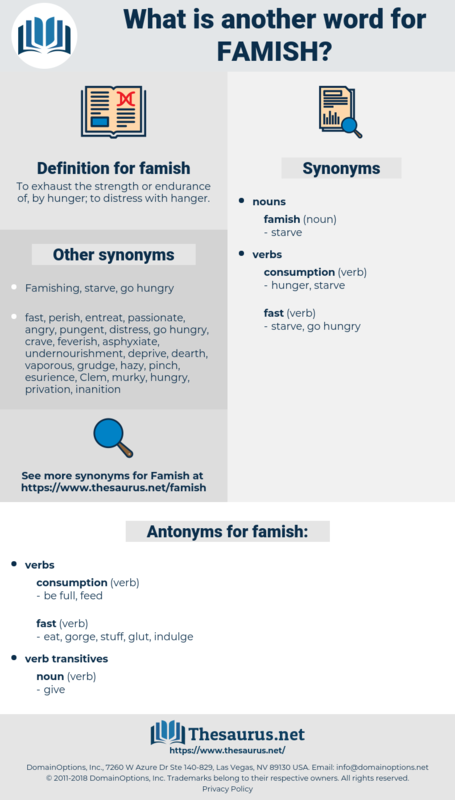 To exhaust the strength or endurance of, by hunger; to distress with hanger. eat, gorge, stuff, glut, indulge. faineance, fenusa, fang, fink, fennic, funny house, finances, finance, fiancee, feng shui, finch, foaminess, feminise, Funnies, funniness, funka, finesse, funk, feminize, foaming, fewness, finis, finish, fivepence, fence, famous, finnic, finicky, fiance, fungous, fawning, funky, fungia, fungi, finocchio, faience, funkaceae, faunus, fancy, fomes, feminineness, fumes, fineness, finnish, fibbing, fungus.